PLANNING A NAUTICAL WEDDING? Crisp navy never goes out of style. Classic. 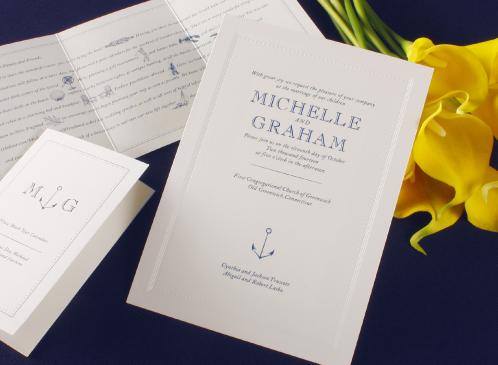 These Vera Wang and William Arthur sea-inspired invitations and save the dates just may float your boats, soon-to-be-mateys. Vera Wang Embossed Grosgrain Invitations. All very tastefully inviting. TYING THE KNOT | Vera Wang Knot Save the Dates and Wine Tags; William Arthur Navy Anchor Invitations; Vera Wang Anchor Invitations. SEA FAIR | Top left: Snappy Vera Wang Sapphire Bordered Save the Dates. 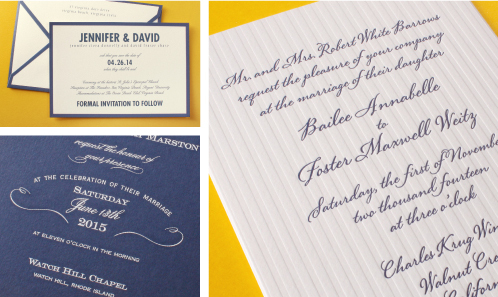 Bottom left: Elegant Engraved Navy Blue Invitations from Style Me Pretty by William Arthur. Right: Letterpress Embossed Pinstripe Invitations. Ship shape! For more fantastic nautical inspiration, visit http://www.mainemaritimemuseum.org; http://www.cascobaylines.com; http://lobstershacktwolights.com.